If there is anytime to make a tomato salad it is now. Tomatoes are in full bloom in this country and you can find them in an abundance, even the supermarkets are full or them, multi-coloured, shining like the rainbow. The one time of the year that you can make the traditional Italian caprese – Tomato, mozzarella, basil and olive oil and it won’t taste of cardboard. The smell of a tomato almost sums up summer, along with a raspberry. To close your eyes and take a deep breath transports you to wonderful summers gone by, a flicker of a memory before being pulled back to reality. And the taste of a really good summer tomato is second to none, and is something that should be cherished. The wonderful thing is, a good tomato should be served simply – nothing better than with good quality olive oil and sea salt. If you are looking for a sweet tomato in the rest of the year the one place that we would suggest you look is Natoora, their Sicilian Datterini tomatoes are to die for. If you find yourself with a fabulous harvest then have a day in the kitchen and jar them up to use over the coming months. Our favourite easy tomato recipes are to either make them into a tomato sauce (that can be used for pasta, in stews or sauces, or with vegetable dishes), or into a spicy tomato chutney, or to make them into a confit. For this you want to pour over boiling water so to take off their skins, chop them in half and cover with olive oil, chili flakes, oregano, thyme and salt and pepper and put in the oven at 150c for about 2 hours. If you want more ideas Skye Gyngell has a whole chapter on tomatoes in her book “My favourite ingredients”, our favourite is her tomato and bread soup where she uses up even the oldest or bashed tomato, or her Lobster with white beans, tarragon and tomatoes, YUM! 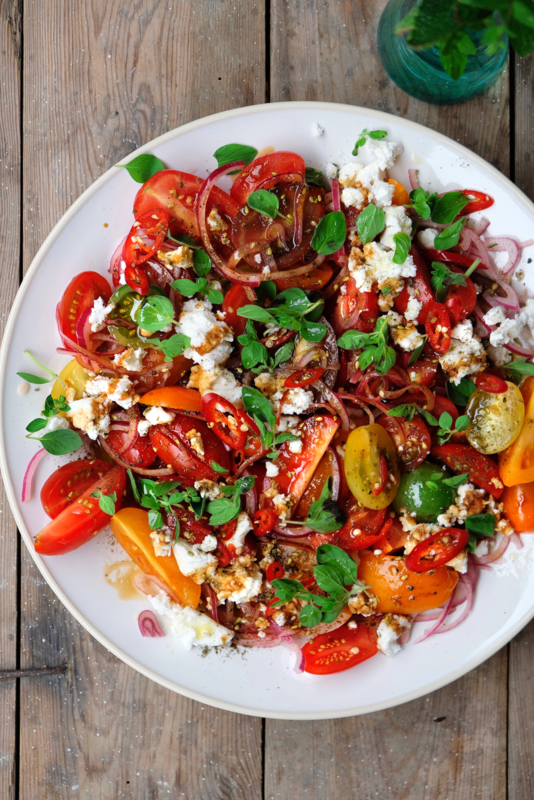 This tomato salad will sit well with most dishes – very well with chicken, lamb or beef. We happened to serve it with a plump roast chicken stuffed with lemon and garlic, roast carrots with a limey yoghurt dressing and a summer leaf salad, followed by some delicious cheese (bought by Lucy’s brother, thank you Tom), and a good bottle of red. A very happy Sunday lunch. 1. Whisk together the cider vinegar, honey and salt together and add the red onion and toss. Place to one side. 2. Slice your tomatoes – perhaps differently; slice the baby tomatoes in half, and the larger tomatoes into chunks, place on your serving platter. 3. Whisk together the garlic, olive oil, lemon juice and season with salt and pepper, pour over the tomatoes and toss. 4. Scatter over the pickled red onions, crumble the feta, sprinkle over some Za’tar and the sliced chilli and the drizzle over the pomegranate molasses. 5. Finish by drizzling with olive oil and scattering over fresh oregano (or basil).